Pancit and turon are two favorite merienda treats that could use with a bit of updating. Kids today usually go for anything Western. Using a bit of creativity and with a little extra effort, you can turn your tired merienda staples into exciting new snacks. You’d be hard pressed to think of more beloved merienda snacks than pancit and turon. These universal and ubiquitous offerings are available in any street corner, providing children and adults with fuel to finish the rest of the day and also serve as a break where you can catch up with friends. COOK Magazine Editor in chief Dino Datu came up with familiar favorites but with a Mondelez Philippines twist. 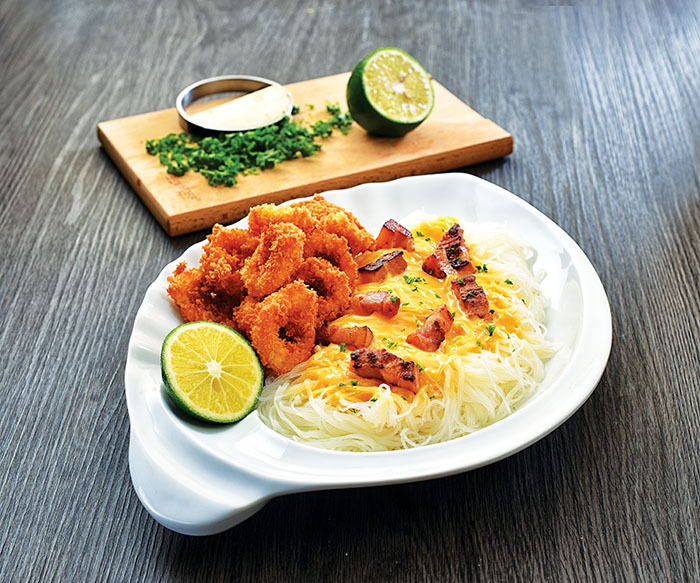 Have you ever tried 3-Cheese Pancit? Utilizing Kraft Cheddar Cheese, Eden Cheese and Cheez Whiz, this is pancit like you’ve never had before, all cheesy and gooey. 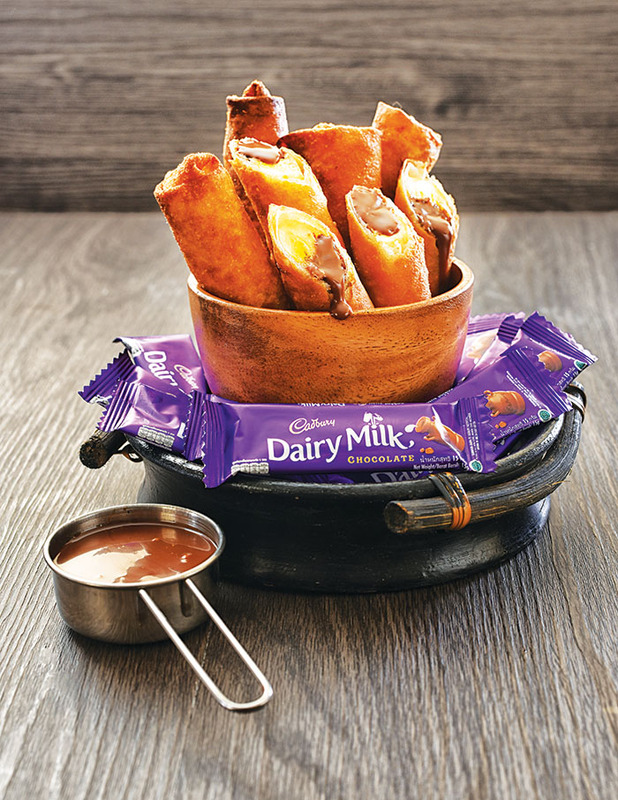 The humble turon is given a luxurious bent with the addition of Cadbury Dairy Milk. The velvety textures and the crunch of the turon provide a delicious contrast no kid or adult can say no to. Place saba banana slice and Cadbury Dairy Milk piece on one end of lumpia wrapper. Roll wrapper, folding the sides in. Roll tight! Wet the end of lumpia wrapper with water and continue rolling until secure. Continue with the rest of the ingredients. Deep fry over medium heat until golden brown, about 2-3 minutes. Drain over wire basket or over paper. Chop Cadbury Dairy Milk chocolate bar into small pieces and place in a large mixing bowl. Gently heat cooking cream until slowly boiling. Pour hot cream over chocolate and let stand for 5 minutes. Whisk until well combined and pour into a serving bowl. To make cheese sauce, melt butter in a pan. Add milk and slowly whisk until smooth. Continue cooking for 5 minutes, stirring constantly to avoid lumps and sauce sticking and burning to the bottom of the pan. Turn heat off and gently add Eden Cheese, Kraft Cheddar Cheese and Cheez Whiz. Stir until well combined and smooth. Set aside. Season squid with salt and pepper. Dredge squid in flour, shaking off excess. Place bihon in a large bowl. Pour boiling water over pancit bihon and leave in water until soft. Strain softened bihon and set aside. Mix bihon with half of the cheese sauce and gently heat in a large pan. Place cheesy bihon in a serving platter and pour the rest of the cheese sauce over the noodles. Arrange bacon and fried calamares on top. Sprinkle with chopped parsley or spring onion for garnish. Previous story All Italian lunch and dinner buffet at Café Eight of Crimson Hotel… Authentic and fresh!